I'm back with a short entry for Nails Talk today. To celebrate the opening of Iron Man 3, A Lacquered Affair has organized the #SGSwatchFestFringe event for today. Red and gold are the main colors of the Iron Man's suit and that's the main colors for today's swatch fest. Thinking about it, it's been more than a month since I last wore red nails so this is a good excuse for me to bring out my new red polish to play. After cracking my brain for ideas, I decided to go for a reverse gradient mani, something which I have not done for a long time. 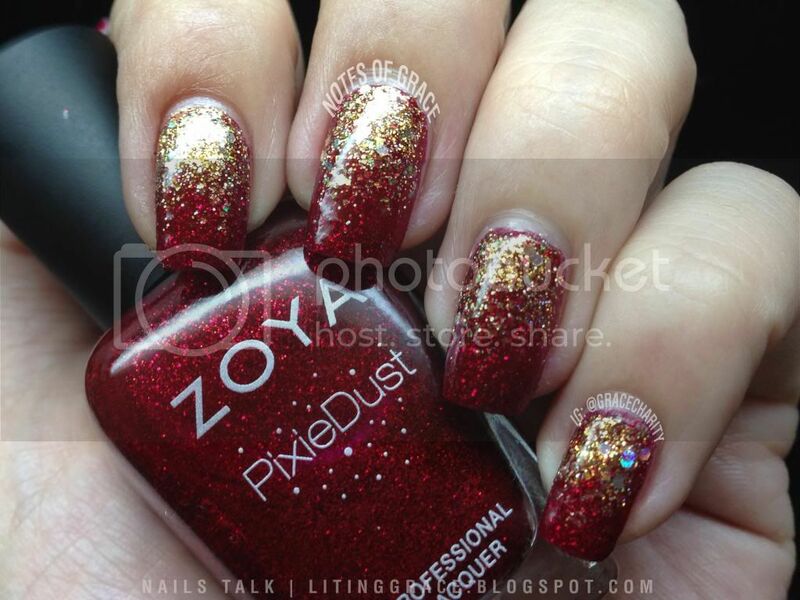 I chose Chyna from Zoya Pixie Dust from their Winter 2012 collection as the base color. I got this red beauty from Timtam about a month back but I didn't have the chance to use it. Chyna dries to a matte and textured finish (like grain sand) and application was surprisingly easy and smooth. No problem at all with the application or formula. It's also really sparkly! 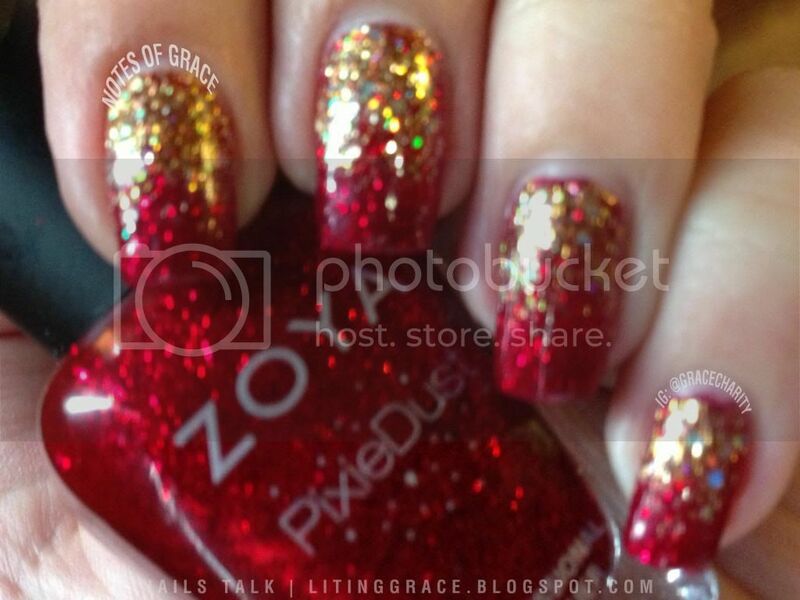 The reverse gradient was created with OPI Goldeneye (Skyfall collection), The Face Shop YL702 and PA A45 polishes. Taken under a daylight lamp, no flash. For this mani however, I decided to not go with the textured finish and painted a coat of Seche Vite top coat over it. Even the top didn't dull the sparkles! In fact, it became even more sparkly with the top coat! Unfortunately the photos can't show how sparkly my nails are. It's really so much sparkly in real life and I can't stop looking at my nails! This photo is to show how sparky my nails are. Spot the holographic effects too! One last photo for the way. 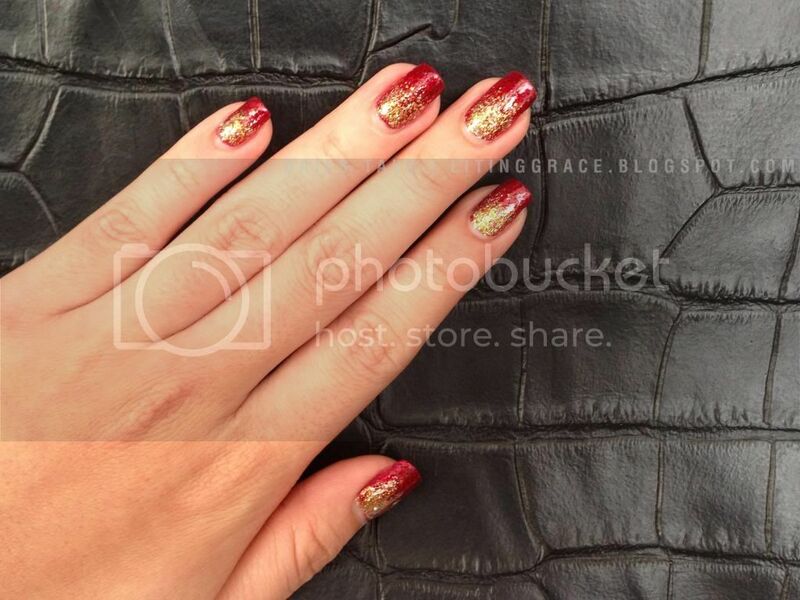 All right, that's all I have for today's Nails Talk, don't forget to check out #SGSwatchFestFringe for more red and gold mani! Till the next, have a great Saturday!